I’ll admit it, my daily trips to Trader Joes are taking a serious toll on my wallet, and my sanity. Not only am I indulging in spontaneous purchases that fulfill my momentary need for of all-things-salty-and-sweet, but I’m also over-purchasing and allowing foods (that bag of spinach from 2015, ahem) to go the waste. …within reason. You can’t save money on meals if you’re wasting half of your food! While warehouse clubs are perfect for buying paper products and long-lasting canned goods, it isn’t always a bargain to buy 30 apples knowing you only eat one or two a day. Rather than focusing on how much you can buy for your buck, save money by opting for the generic version of similar products in reasonable sizes. This podcast has some great background info on generic versus brand name to clue you in on what to look for! This has been a personal goal of mine for 2016. Using an old white board, I’ve started jotting down meal ideas for the entire week. For even more convenience, this online one is a great option if you want your co-habitants to share in the fun! While breakfast and lunch are usually repeat offenders, I used to spend a lot of money visiting the grocery store each afternoon to scrounge for dinner ideas. By creating a grocery list based off my meal plan, it saved me big by eliminating those last minute-purchases, forcing me to use what I already had on hand. The less time you spend there, the less likely you’ll buy crap you don’t really need and the more likely you’ll stick to your frugal eats plan. Maybe that Oreos craving isn’t as urgent if you have to wait until Sunday to visit the grocery store. Leftovers get a bad rep. Keeping food fresh and presentable is all about how you store it in the fridge. Using appropriate containers allow you to easily transition from fridge to microwave by allowing you to heat up yesterdays eats without dirtying another dish. Bonus, the see-through glass containers will be a visual reminder to dig in! Opaque containers have a way of getting mysterious tossed into the back of the fridge. And no, I don’t mean stopping at your neighborhood Chipotle. By skipping the costs used to transport foods, you’re getting produce grown close to home for the farmer’s price. Farmer’s markets allow you to bargain with the seller and, if you prefer to sleep in, you can go later in the afternoon to score a deal on the products that haven’t sold earlier in the day, give or take an edible bruise or two. If the farmer’s market is too much of a hike, set up your own window sill herb garden or put the ends a few stalks of celery or lettuce leafs into a glass of water to grow your own. Every little bit counts! As a ten year vegetarian veteran, I may be a bit biased. But the proof is in the pudding (i.e. beans!). Considering meat is typically the most expensive part of a meal, substituting it with a plant-based protein source can save you almost $1,000 a year! If all else fails, limiting your eating out is the easiest way to save. 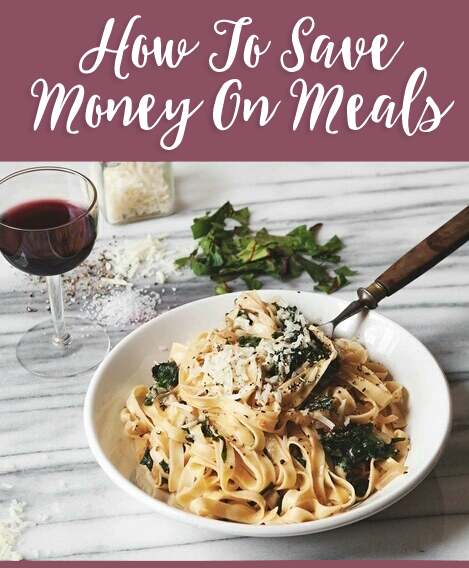 We all know that meals at home are cheaper, and you can save so much more by DIYing your dinners. While I could never forgo my happy hour chips and salsa dates completely, I try to keep it to once or twice a week. Even more, take advantage of daily deals and plan your night-out meals on a weeknight when you can take advantage of restaurant specials due to slower business days. Half priced sushi Thursdays? Yes please. Free side of fries Monday? You got it. What’s your favorite way to save on meals? The easiest way for me to save on money of food is to make my tea and coffee at home. A couple dollars each morning really add up and, plus, I enjoy the extra minutes I have in the morning instead of hurrying to beat the Starbucks rush. 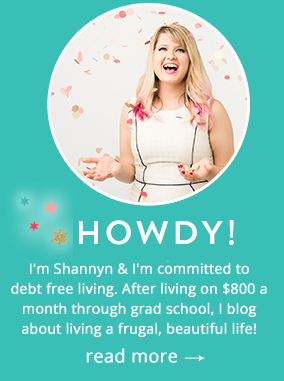 Admittedly, I am currently on a Ramen and cereal diet — it’s super cheap, fast, and easy. I’m studying for the CFP exam and I don’t have time or money to worry about cooking. Once the exam is over, I’ll shift back to a healthier, more balanced diet!! I’m a huge cereal fan…plus if you add a banana is a well-balanced meal, right?! But I understand, definitely phases in life we’re meal planning is the last thing on your mind!